Although not necessary, it is recommended that any person who uses pesticides of any sort learn about proper pesticide application and safety principles by attending one of these sessions. Farm employees also benefit from getting certified, even if they don’t directly apply pesticides. The safety lessons learned at this session may save your farm from a problem in the future. Please remember that this program is for private applicators only. If you apply pesticides for hire, you may need to attend a Commercial Applicators Training Session. Call Scott at 715-732-7510 if you are questioning your status as private or commercial applicator. 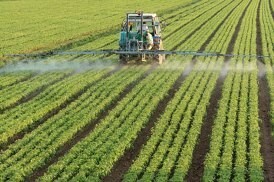 Two options to become certified or re-certified as a private pesticide applicator. Attend one of the training programs conducted by Extension and successfully complete evaluation. There is a $40 fee which covers the five year license period, reference book and educational materials. To have your materials sent to you, return payment with the form indicating the session of choice or if taking self-study option. You may also register and pick up your materials in person at an Extension office. For more information or to register, contact the Extension Marinette County office at 715-732-7510.